Adrienne has operated a boutique Public Relations firm since 2003 focusing on Entertainment and Sports industries while also assisting clients both large and small, in industries as varied as non-profits and startup business owners to publishing and spiritual ministries. Adrienne’s creative ideas and media contacts have largely contributed to her success. Graduating from Morgan State University with a degree in Public Relations as well as attending Strayer University for master’s level classes in Marketing, Adrienne has spent years using her communication skills to help causes, companies, and events create positive change. Because of being a part of their team, clients have reported seeing greater exposure and understanding of their brand than ever before and strengthened relationships with people who have the capacity to impact their success. Adrienne has provided public relations services to a variety of Television & Sports stars including cast members from Love & Hip-Hop Atlanta, and The Wire, Singer/Actress Tanya Blount, and Comedian Jay Phillips. Adrienne’s firm was the PR Agency of record for the Lingerie Football League, Timeless Brands; an innovation experiential marketing firm and Streetz 94.5 Radio in Atlanta. Along with those individuals/organizations mentioned, Adrienne also provided multi-city book tours for authors including Candace Dow and Toy Styles as well as organizing charity events for the Carpenter House Foundation and the Kurk Lee Celebrity Basketball Game. Along with her Public Relations and Marketing background, Adrienne is also certified in Conflict Resolution and Conflict Management; a skill that more and more large organizations are requiring upper management personnel to be trained in. This certification has helped Adrienne become better equipped to handle crisis management situations along with any situations that may arise and cause potential negative publicity for a client. Adrienne has held Conflict Resolution Workshops with several non-profits, male & female youth groups and Women’s Empowerment Conference’s. In March 2018, Adrienne successful held her first youth conference in Atlanta, Georgia called the Make a Girl a Woman conference. This conference is dedicated to encouraging and empowering young ladies ages 14-23. 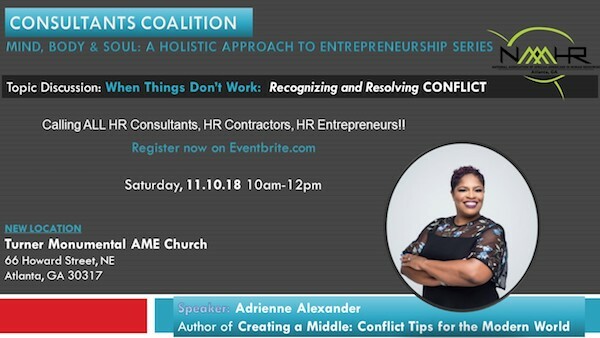 September 2018, Adrienne added the title of Author to her resume with the release of her first book Creating a Middle: Conflict Tips for the Modern World; which is available on Amazon and Barnes and Nobles.com. Adrienne hopes this book will become the go-to resource for individuals and businesses alike who may benefit from the skills and guidelines included for effectively communicating and resolving conflict. In summary, Adrienne is a public relations consultant who loves what she does because of the satisfaction she gets impacting lives in very meaningful ways. She goes above and beyond for her clients and will accept nothing less than greatness when it comes to their success.